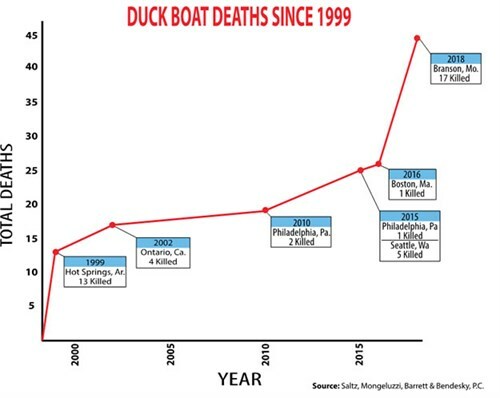 Advocate for duck boat victims has for years urged U.S. ban the fatally flawed boats. Philadelphia, PA -(July 23, 2018) – Trial attorney Robert J. Mongeluzzi today is commending a former head of the National Transportation Safety Board (NTSB) for supporting ‘in the name of public safety’ a shut down of tourist duck boat operations following last week’s disaster in Branson, Missouri that claimed 17 lives. Mr. Mongeluzzi, of Saltz, Mongeluzzi, Barrett & Bendesky, P.C., who in 2010 and again in 2015 called for the ban based on his experience representing duck boat victims, said he hopes that current Federal agencies and officials, including members of Congress, finally take decisive action since the duck boat tour industry has turned a blind eye in the past to safety recommendations from, among others, the NTSB. “Former Chairman Hall, based on his published statements, is in complete agreement with our position that these half bus-half boat novelties are actually ‘tourist deathtraps’ on land and in the water,” said Mr. Mongeluzzi. The attorney, whose firm represented the student-tourists killed in the 2010 Philadelphia duck boat disaster, said since at least 1999 (the Arkansas Miss Majestic incident that killed 13) government regulators have known that the fixed canopies on the modified WWII landing boats prevented passengers from escaping in an emergency. The 2010 Philadelphia case settled collectively for $17 million just before going to a Federal court jury.